Enjoy this beautiful view of the Pool and Sparkling Gulf Water Imagine this Stunning View every day from your second floor balcony Comfortable Sunny Living Room Master Bedroom with Comfy King Bed Private Master Bath with the Master Bedroom New flat screen TV in the Master Bedroom Comfortable Living Room Seating Surprisingly Spacious Lovely Fully-Equipped Kitchen. Includes single cup Keurig coffee maker and 12-cup coffee maker. 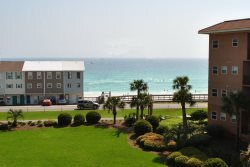 Hallway Bunks are fun for the Kids Second Bath for Everyone`s Convenience Washer and Dryer in Condo for a more enjoyable stay Love the View from your Balcony Enjoy Free Beach Set Up - 2 Chairs and Umbrella Splash in the Front Pool. Faces the Gulf. Steps to the Beach. North Pool Near Tennis Courts Hot Tub Near North Pool Exercise Room On-Site Plenty of Parking Close to Your place Free Tennis Courts for Guests Welcome to Maravilla Beautiful and Family-Friendly Welcome to Maravilla. Gated entrance from Scenic Gulf Drive. Entrance to Private Beach for Maravilla Guests Thanks for the great review Please come stay with us again Thanks for the nice comments. Please come stay with us again. Spacious and comfortable with great view of the pool and full Gulf front view. Just a few steps to the beach, close to the elevator and stairs. Pet friendly for small dogs. Free Beach Set-Ups Included! (2 Chairs & Umbrella). Free high speed internet. Extensive book selection is available in this condo for reading. Call or book online today!